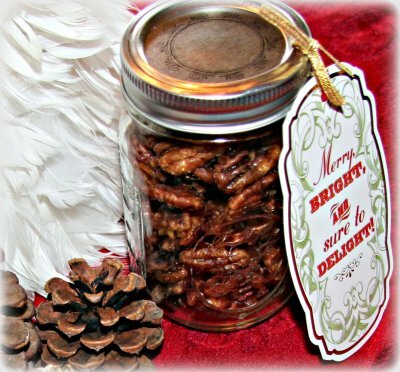 It’s the most wonderful time of the year again (unless you’re a grumpy Grinch) and I think these sweet & spicy pecans make a great gift. Think hostess, teacher, neighbor, anyone who deserves a thoughtful little something. They make a lovely and addictive snack on their own and they do wonders for a winter salad. Spinach, pears, blue cheese and these guys tossed in a balsamic vinaigrette is my idea of salad heaven. 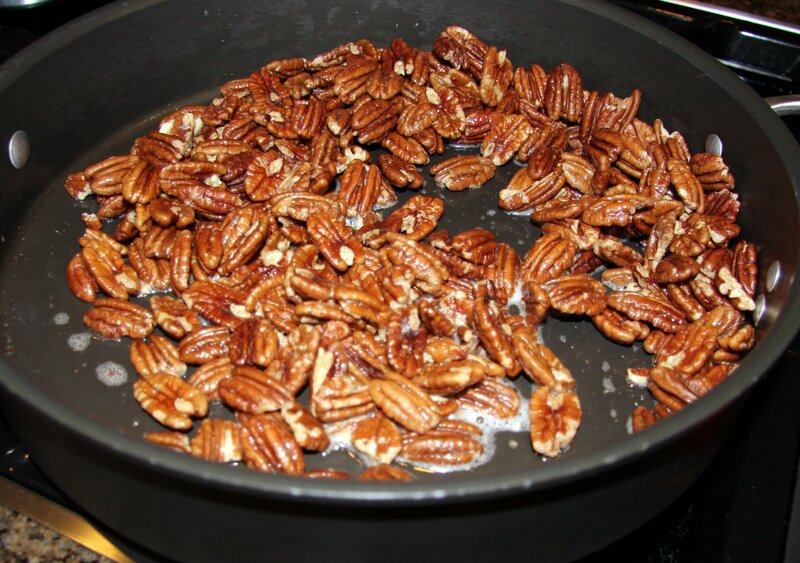 Those glazed pecans you can buy at the market don’t come close to competing with these babies. They’re so good that after receiving them in a basket I made for him and his girlfriend, my nephew actually called me on the phone to get the recipe. If you have ever had a twenty-something nephew you may appreciate how huge that is. Oh, and don’t worry whether or not the recipient likes nuts. These make a great re-gift to a Grinch. 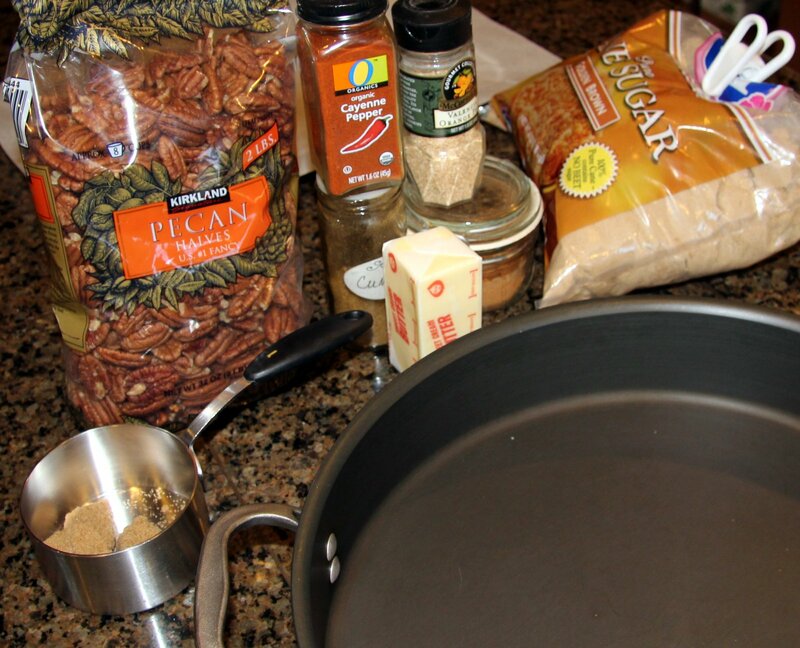 ~If you want an even spicier kick, increase the amount of cayenne to your taste. Preheat oven to 250 degrees. 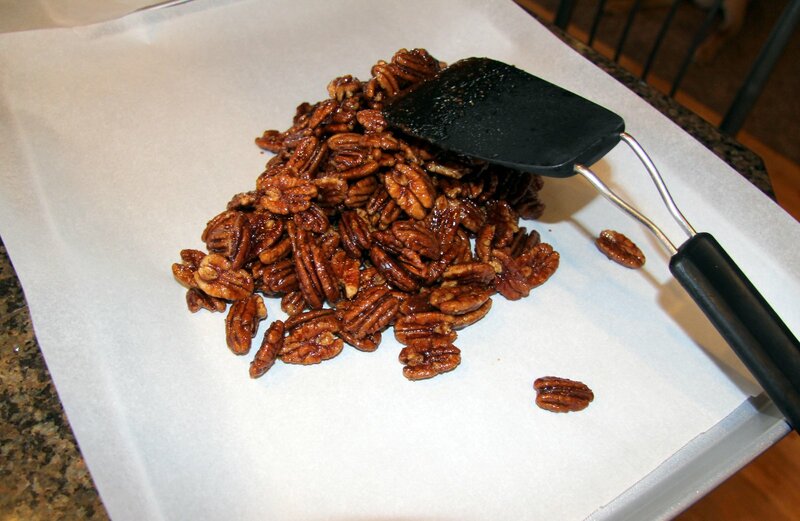 Line a half sheet pan with parchment paper and set aside. Gather your ingredients. 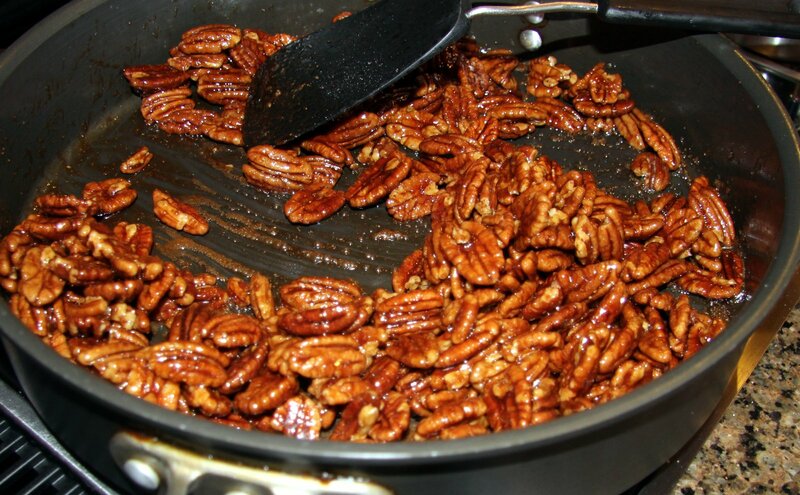 FYI, Costco is a good place to find pecans at a reasonable price. 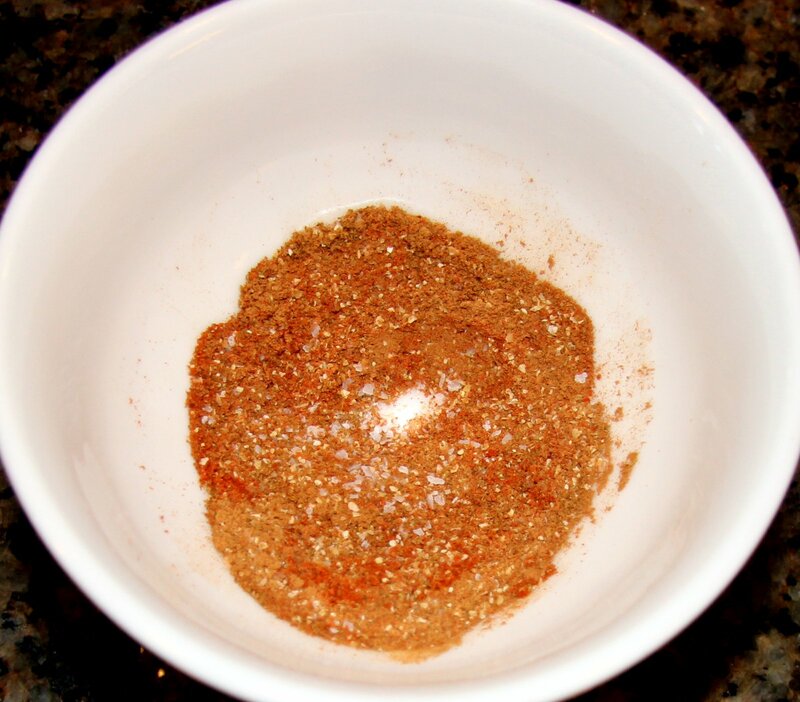 Combine the salt, cumin, cayenne, cinnamon, and orange peel in a small bowl, stir and set aside. 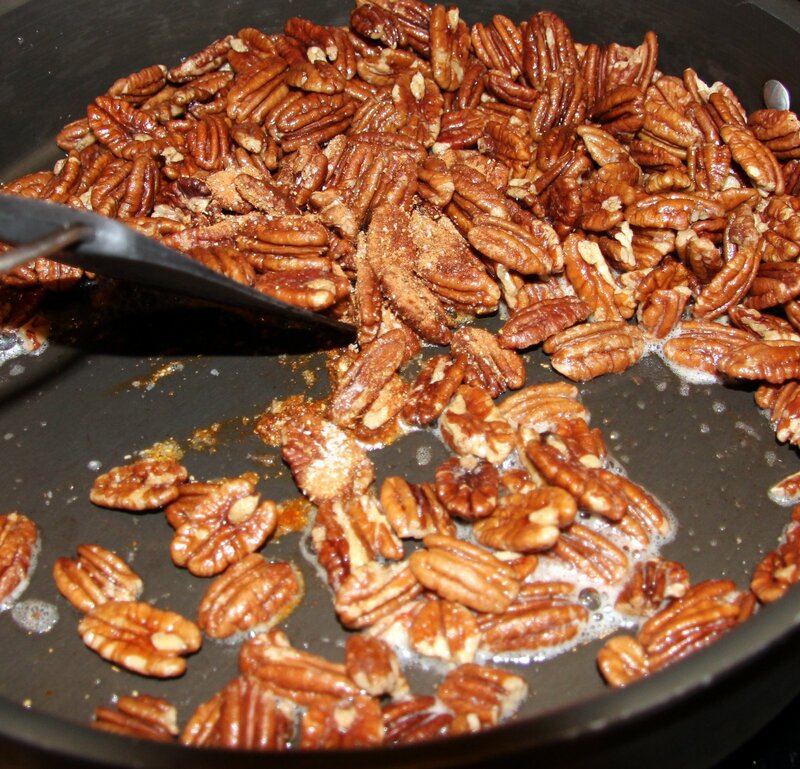 Place pecans in a large cast iron skillet and set over medium heat. Cook, stirring frequently, for 4 – 5 minutes or until they start to brown slightly and smell toasted. Add the butter, stir until it melts. 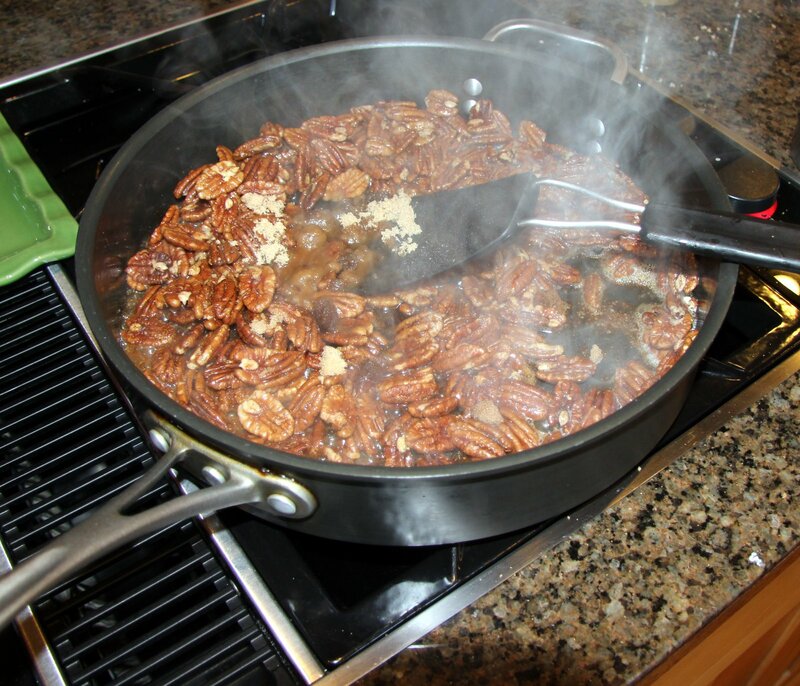 Add both sugars and the water, stirring until the mixture thickens and coats the nuts, 2 – 3 minutes. 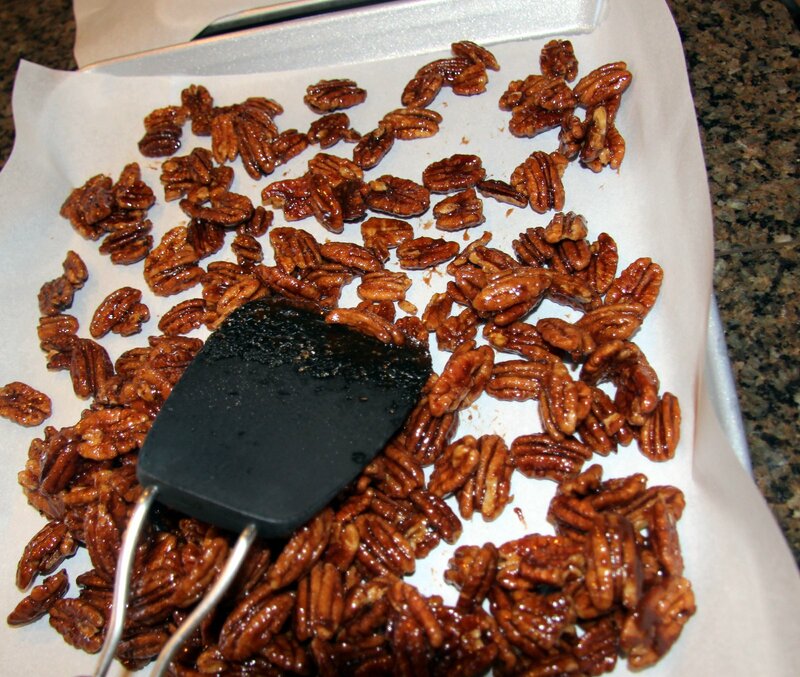 Transfer the nuts to the prepared sheet pan. Separate with fork or spatula. At this point, Alton says to let them cool completely. You can do that if you want. Or, you can place them in the preheated oven. Bake 5 minutes (to allow the oven to come back up to temp after being open) then turn the oven off and leave them in there until they are completely cool. This will take a couple of hours but it will make them extra crispy and delicious. I highly recommend it. Remove them from the oven and place them in cute little jars.